“Hm, I’m surprised you chose this trail,” J’s voice floated over the snow and back towards me. The comment was more a vocal processing than an accusation, and I didn’t engage in repartee since I was busy huffing and puffing up what would normally have been a very reasonably graded hill. I mean if we were running it, it’d be fine. But of course we weren’t running. We were biking. Or, hike-a-biking. Hike-a-biking at under 2kph. After that episode of biking ended, J mentioned something about “frustration and despair”… All in good fun. Seriously now though, we wanted to get in some riding and I proposed another project. J, upon hearing it, immediately pronounced “that sounds horrible”, with a note of finality. 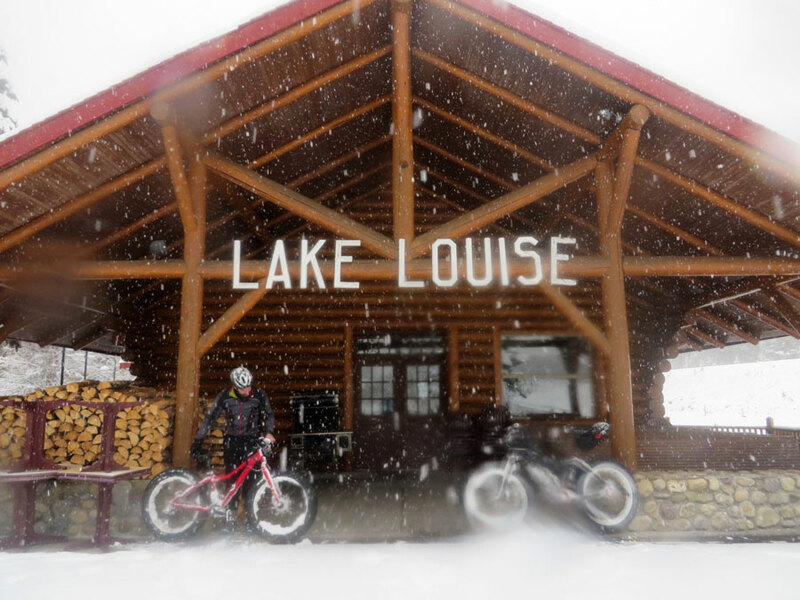 Not wanting to subject a friend to horror already having subjected him to “frustration and despair” as previously mentioned, and many other projects “beyond the call of adventure” besides, we settled on Lake Louise for our ride the following Saturday. Should be pretty straightforward, I thought, and I wasn’t proven totally wrong. The area reports looked good, and J’s the kind of guy who’ll do early starts and will drive a couple hours to find snow. I’m going to say this was an exploratory ride. We certainly explored, which involved a lot of here-and-there jaunts finding trailheads and sussing out conditions and general recon/ beta for future trips. It snowed all day while back in Calgary it was +14C. The restaurant by the rail track, closed for the season. 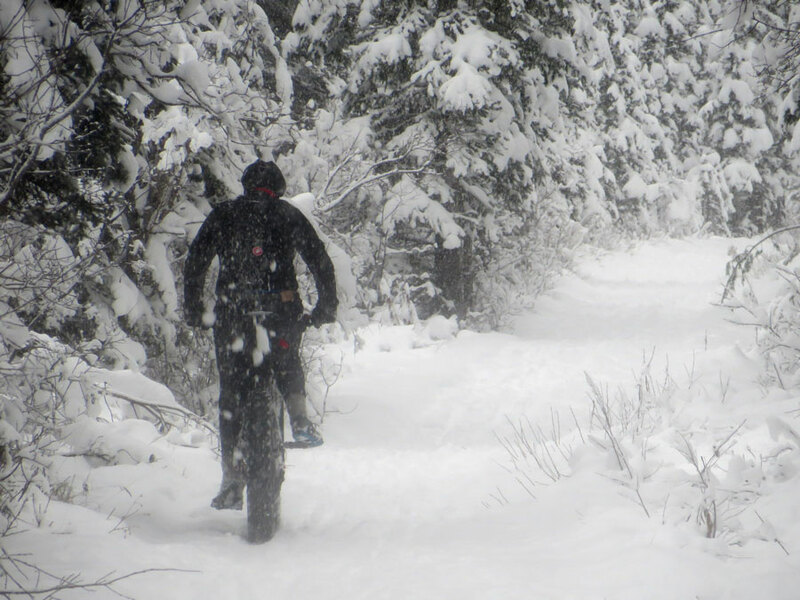 We may have been distracted by the mac’n’cheese at Laggan’s during our extended lunch break – this was not exactly a backcountry trip – but when we headed out post-lunch we somehow we got it into our heads that now we wanted to ride up the road to the lake proper. Or more truthfully we never decided per se on doing that, but it happened anyway. We avoided being run over by cars and a snowplow and before long reached Lake Louise where J took the following obligatory bike-selfies. At the Fairmont Chateau the front attendant also gamely posed for a photo pretending to valet park J’s bike. 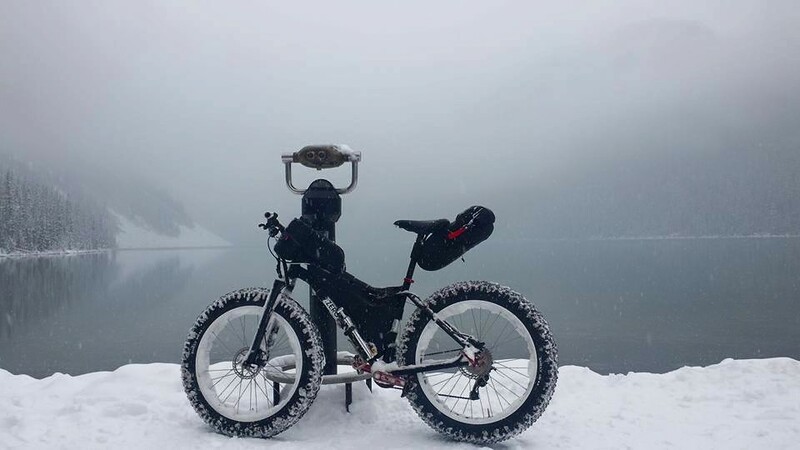 If there’s one thing I learned, fatbikes catch the attention of the public, whether cyclists or non-cyclists and men and women alike, and J was in his element fielding their questions. We also learned that a person taking photos of a stranger’s bike will most likely take a photo of the obnoxious red one with liberal ostentatious stickers and manufacturer’s decals splattered on the frame, instead of the sophisticated and subtly styled, hand-built and significantly more expensive black one. The snow made such satisfying Styrofoam-y popping sounds. 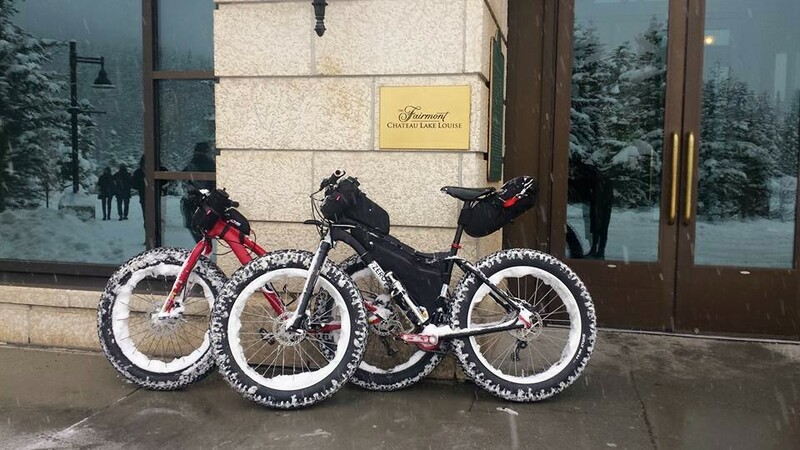 “Fatbiking is serious business”, to borrow a phrase from J. Stay tuned as we do more stuff on our bikes this winter, some of which will no doubt sound asinine to people who take fatbiking seriously. 20151130: November Subzero! Bring on the snow and ice.